Sill rolling: 60-ish TV evergreens Jerry Springer and Charles Gibson. 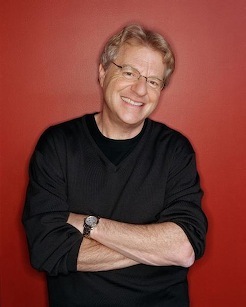 ***Jerry Springer is replacing Regis Philbin as host of NBC's America's Got Talent, the Simon Cowell-produced competition series scheduled to return this summer. Springer, fresh off a crowd-pleasing run on ABC's Dancing with the Stars, is the "perfect ringmaster" for the show, says NBC alternative programming head Craig Plestis. "To say the least, he is known for presiding over an unpredictable show where the unexpected is the typical order of each day." 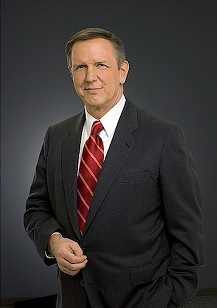 ***It's just one month, but a narrow February "sweeps" victory by ABC's World News with Charles Gibson may signal the impending end of a long first-place reign by the NBC Nightly News with Brian Williams. World News averaged 9.677 million viewers compared to Nightly News' 9.566 million in February. That represented an 8 percent year-to-year increase for World News and a 3 percent decline for Nightly News. The CBS Evening News with Katie Couric averaged 7.586 million viewers, down 5 percent from last February, when Bob Schieffer anchored the broadcast. Gibson also placed first with 25-to-54-year-olds, the main advertiser target audience for news programming. Coincidentally or not, and you can draw your own conclusions, NBC's Williams left for Iraq over the weekend and began reporting from the war zone on Sunday. ***On the entertainment front, it was a tale of two networks in the February sweeps. Paced by the Super Bowl, CBS easily won with total viewers over runnerup Fox. Led by American Idol, Fox in turn edged CBS among 18-to-49-year-olds, the advertiser-preferred audience for entertainment programming. ***ABC has dumped The Knights of Prosperity, a midseason sitcom, and will replace it with an According to Jim repeat on Wednesday (March 7) at 7:30 p.m. central time. George Lopez reruns then will fill in for the next two Wednesdays.